It has become common in Liberal Democracies for the government and its bureaucracy to ignore court orders and legal processes when they do not suit, so this delay should not come as a surprise. Despite potential problems tied in with a legalistic challenge to the occupation, which I have examined before, this does represent a significant victory for the Palestinians – one which is worth dwelling on. There appear to be a number of reasons why the villagers of Bil’in were largely successful, which we may be able to apply to other situations around the world. The discussion below, which identifies the possible reasons for the success at Bil’in, is a modified version of a longer essay I wrote earlier this year, hence the formal footnotes. I have taken it as read that the official reason given for re-routing the wall – humanitarian concern – is not worth talking about. Instead, the specific contribution of different aspects of the nonviolent resistance has been examined. The role that internationals play in limiting the violence is significant, because it widens the space for the Palestinians to engage in resistance which would otherwise be too dangerous. As another ISM founder, Ghassan Andoni, notes, “getting a group of Palestinians to go and remove a checkpoint might result in a few of them losing their lives and most of the others getting injured or arrested. You cannot build a massive civil-based resistance with this much risk; this much risk can destroy it.” The potential for non-violent action is greatly increased by the presence of internationals. Alongside this, they can raise the morale of the Palestinians, because they are reminded that they are not isolated, and are given the space to engage in meaningful non-violent actions within a more secure environment. One of the reasons that internationals and Israelis are at less risk of violence comes within the second basis for the success at Bil’in. They have far more access and appeal to global mass media. It is clear that the international media will take more of an interest in a story if internationals are present. The deaths of Rachel Corrie and Tom Hurndall were widely reported in the West, and their stories became famous. A play about Corrie’s time in Gaza was co-written and directed by Alan Rickman. This attention is at variants with the reporting of the deaths of Palestinians; highlighting this issue, the Observer says that “on the night of Corrie’s death, nine Palestinians were killed in the Gaza Strip, among them a four-year-old girl and a man aged 90.” None of these deaths reached anything approaching comparable coverage. In 1988 Herman and Chomsky argued that, due to various institutional and market pressures, the mass media has a tendency to report the news in a manner favourable to specific elite interests. The increase in the capacity of communication networks has the potential to obscure such institutional media bias, to give a broader spectrum of views than would otherwise be permissible, and to pressure mainstream media to report to stories they might otherwise ignore. In 2004 Iranian bloggers used a ‘Google Bomb’ to raise the profile of the debate about the name of the Persian Gulf (which National Geographic had referred to as the Arabian Gulf alongside its recognised name). Their actions helped to attract worldwide media attention. Similarly, in 2007, an awareness campaign run through Facebook criticising HSBC’s policy on overdraft charges attracted mass media attention and succeeded in changing the bank’s position. The communication factor is also enhanced by the increased number of NGOs and Human Rights organisations working in areas of conflict, who are able to provide up-to-date information which is generally perceived as impartial. The OCHA provides weekly bulletins on the humanitarian situation in the Occupied Territories, and organisations such as Human Rights Watch (HRW), Amnesty International (AI) and B’Tselem maintain a constant presence. The web presence of these organisations and their findings means that anyone can gain access to reports and distribute the information. In the context of Palestine, this situation has meant that any repression has been reported more widely than it otherwise might have been, particularly when internationals were involved. The human rights organisations have also helped to clarify the details of incidents and scrutinised potential misinformation; when the IDF claimed that Tom Hurndall was killed whilst “wearing camouflage attire moving towards an IDF position while shooting,” HRW were able to establish that this was not the case. Writing in 2001, Andoni notes that the current resistance was more centralised than would be ideal, but he does see potential for movement. 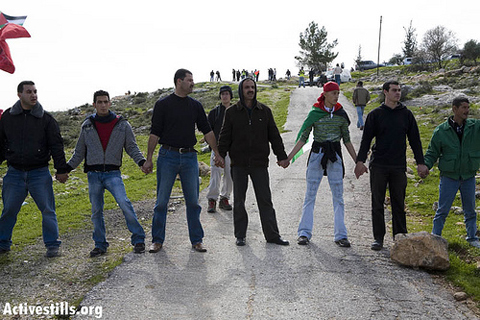 The protests at Bil’in could be seen as one example of this potential realised; they are organised on the local level, and the groups who join them in solidarity are based on horizontal modes of organisation with no formal chain of command. By increasing the involvement of participants in all stages of the resistance, decentralised structures can help to create a sense of ownership and thus maintain participation. More significantly, they are also harder to stop than more centrally organised movements, which can be susceptible to bribery, and which can make deals to the detriment of those on the ground. It is possible that an agreement between Israel and the Palestinian Authority would be unlikely to stop the villagers at Bil’in from protesting if it did not ameliorate their situation – only firm compromises from the Israeli authorities could achieve this. Another advantage of non-hierarchical organisation for non-violent action groups comes from Kenneth Boulding, who argues that “the larger and more authoritarian the organization, the better the chance that its top decision-makers will be operating in purely imaginary worlds.” When engaging in Civil Disobedience, an intimate knowledge of the facts is necessary, particularly in dangerous regions. It is arguable that hierarchical structures would be unable to effectively manage the situation on the ground. 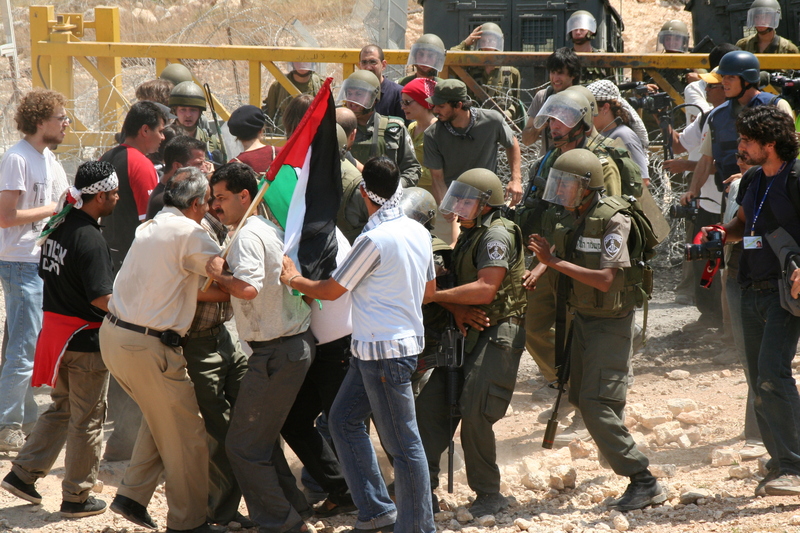 It should be noted that a lack of hierarchy should not mean a lack of wider organisation – that the protests have died down in Bil’in over the past year could be regarded as problematic; a lack of wider coordination has allowed small groups to be placated by promises from their occupier. Nonetheless this is a seperate issue. 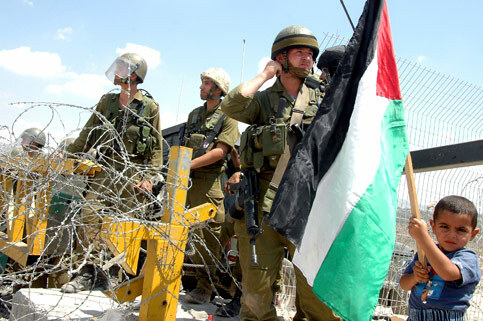 Israeli discourse is often centred around the notion that the occupation of the West Bank and Israel’s wider foreign policy has been necessary as a tool to protect Jews from a hostile Arab world. A result of this has been that failures on the part of the Israeli government to prevent attacks on Jews have been received coldly by the Israeli public, particularly when such attacks have been carried out by the IDF. When Gil Na’amati, a member of AATW who had just served three years in the IDF, was shot in the leg in 2003, there was a significant mainstream debate in Israel. High profile leaders such as Shimon Peres, then Labour Party leader, expressed their shock at the incident; former minister Yossi Beilin, went so far as to say that the soldier who shot Na’amati should have refused his commander’s orders. It would seem that this level of concern within Israel creates opportunities for groups such as AATW to exploit their relative immunity, and thus broadens their utility. Such a situation is also true of the internationals who travel to the Occupied Territories. As mentioned earlier, the deaths of Rachel Corrie and Tom Hurndall received widespread media coverage. Mark Clyde argues that Israel is dependent on the United States for financial and military support; thus it is not only domestic legitimacy that is of particular concern for Israel. It’s reliance means that challenges to the legitimacy of support for Israel in the US and its allies are a problem for the Israeli establishment; it is this mechanism which would appear to give utility to the contribution of internationals in this particular case. If it is the case that the above conditions were instrumental in helping the villagers at Bil’in to win change, then these aspects could be taken to other struggles and applied to other situations. Naturally, it is not a cut and paste situation, especially in the case of the specific political environment. Popular struggle is a very imperfect and incomplete science, which improves and progresses with empirical research and trial and error. Nonetheless, it is hard not to look at Bil’in and recognise the potential which comes from solidarity action, from mass communication and from a non-hierarchical mode of organisation. On Tom Hurndall, see BBC News, “Israeli Troops ‘Wound Briton’,” April 11, 2003, http://news.bbc.co.uk/2/hi/middle_east/2940515.stm (accessed April 15, 2008). He died from his injuries nine months later. On Rachel Corrie, see CNN, “Israeli Bulldozer kills American Protester,” March 23, 2003, http://www.cnn.com/2003/WORLD/meast/03/16/rafah.death/ (accessed April 15, 2008). 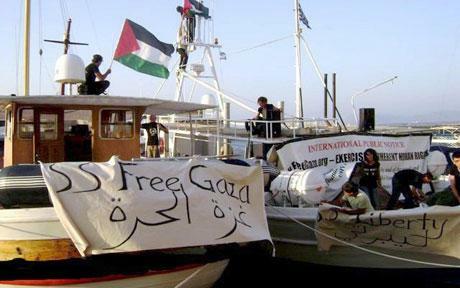 They have also sent activists to Gaza in the past, but the border is currently closed. Huwaida Arraf and Adam Shapiro, “The Uprising for Freedom is an International Struggle,” in Live from Palestine: International and Palestinian Direct Action Against the Israeli Occupation, ed. Nancy Stohlman and Laurieann Aladin (Cambridge, MA: South End Press, 2003), p.67. Ghassan Andoni, “The Role of Internationals in the Palestinian Struggle,” in Live from Palestine, ed. Stohlman and Aladin, p.186. Michael Billington, “My Name is Rachel Corrie,” The Guardian, April 14, 2005. http://arts.guardian.co.uk/critic/review/0,,1459259,00.html (accessed April 6, 2007). Sandra Jordan, “Making of a Martyr,” The Observer, March 23, 2003. Arraf and Shapiro, “The Uprising for Freedom is an International Struggle,” in Live from Palestine, ed. Stohlman and Aladin, p.75. Roland Bleiker, Popular Dissent, Human Agency and Global Politics (Cambridge: Cambridge University Press, 2000), p.97. Herman and Chomsky, Manufacturing Consent. A ‘Google Bomb’ is a technique by which individuals conspire to elevate a single webpage to the top of Google’s search rankings, and thereby raise its profile. In 2005 the term was included in the New Oxford American Dictionary. Michael Theodoulou, “Ideological Gulf Inflames Iran,” Times (London), December 3, 2004. Megan K. Stack, “Iran’s Anger Over a New Map Magnifies a Perception Gulf,” Los Angeles Times, December 2, 2004. Donald MacLeod, “Students Celebrate Facebook Triumph over HSBC,” Guardian, August 30, 2007, http://education.guardian.co.uk/students/finance/story/0,,2159178,00.html (accessed April 12, 2008). OCHA, “Office for the Coordination of Humanitarian Affairs: Occupied Palestinian Territory,” http://www.ochaopt.org/ (accessed April 19, 2008). Human Rights Watch, Promoting Impunity: The Israeli Military’s Failure to Investigate Wrongdoing (June 2005), pp.73-77. http://hrw.org/reports/2005/iopt0605/iopt0605text.pdf (accessed April 19, 2008). Ghassan Andoni, “A Comparative Study of Intifada 1987 and Intifada 2000,” in The New Intifada: Resisting Israel’s Apartheid, ed. Roane Carey (London: Verso, 2001), p.212. Kenneth B. Boulding, “The Economics of Knowledge and the Knowledge of Economics,” American Economic Review, 56:1/2 (1966): p.7. Margot Dudkevitch, Gil Hoffman and Nina Gilbert, “IDF Probes Shooting of Fence Protesters,” Jerusalem Post, December 28, 2003. Mark R. Clyde, Israeli-United States Relations (Congressional Research Service, November 9, 2004), p.3. http://www.fas.org/man/crs/IB82008.pdf (accessed April 17, 2008).